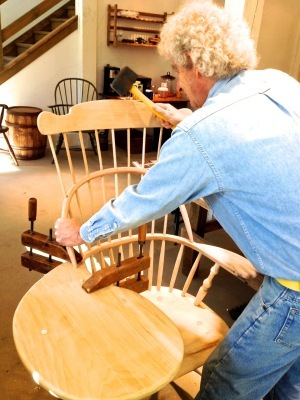 Now you can learn how to create a Windsor chair from Richard Grell at the Woodworking Workshop. All classes taught by Richard Grell include materials and necessary tools are provided. Please click here to view our Registration Form. Create a truly elegant example of the Windsor form. The Comb-back chair that you build will have beautifully carved ears on the delicate comb (crest rail) as well as finely carved knuckles on the arm. 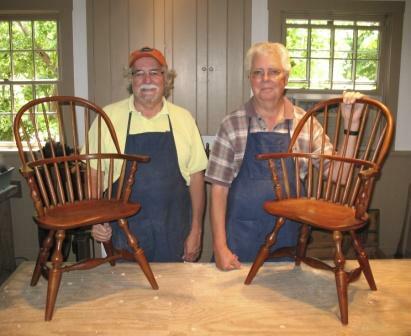 Your woodworking skills will be challenged in this class, but you will be rewarded with new woodworking abilities and a beautiful Windsor chair. 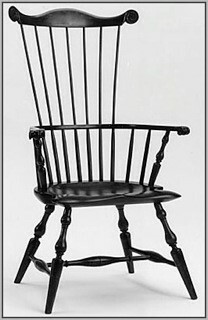 This chair represents the peak of the Windsor’s design during the 18th century. 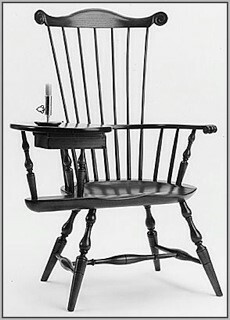 The proportions of the chair you will be creating are representative in the outstanding form of this Windsor. The challenge of steam bending the combined back and arm as one piece will be an unforgettable accomplishment, in addition to creating your chair. This is a unique and rare form of Windsor furniture. You will be challenged to learn the skills of turning on a lathe shaping the delicate top, legs, and stretchers. The top will be turned using a single piece of wood, similar to the 18th century originals. The turned legs will be pegged and wedged through the top of the table. Daryl Hall, of the famed Hall and Oats band, purchased the first Windsor dish-top table I built. Class limited to 3 students. In this advanced class, you will be using all of your skills; carving the crest rail ears, arm knuckles, creating a dovetailed drawer, and the challenge of incorporating a hand planed writing-arm surface. All combined, you will be rewarded with a beautiful example of advanced woodworking skills and a distinctive Windsor chair. My Comb-back or Hoop-back class is a prerequisite. Class size limited to 3 students. In this five-day class you will discover the mystique of the “R. 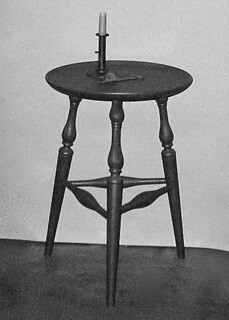 Grell” Windsor chair. 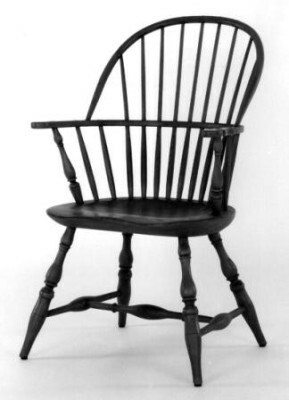 I am now ready to download my 41 years of experience as a full-time professional one-man-shop Windsor chair maker (100,000 plus hours experience). 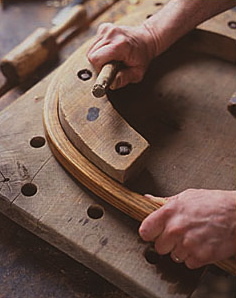 Learn how to use traditional hand tools and methods proven over centuries. You will be building a classic 18th century Hoop-back Windsor chair with all of the proportions and design attributes of a museum-quality piece. Although turnings will be provided due to time constraints, you will receive instruction turning on a variety of lathes, including a 200-year-old foot treadle lathe. 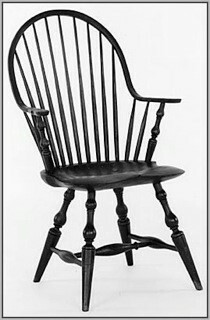 * – I refer to the Hoop-back Windsor armchair as “The Tank.” The structural integrity of this chair, if built correctly, is far superior to any wooden chair ever built in the 18th century or today. Learn why… sign up for the class! In this two-day class you will learn the techniques I’ve developed over the span of 40 years on creating aged painted finishes. You will be painting a Windsor footstool that I’ve built. 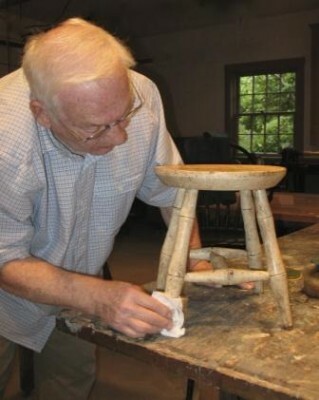 This little stool is a gem…multi-functional and ready to paint. Choose a color and begin the many steps in achieving an aged-paint finish. In this three-day class you will be building a ready-to-assemble child’s Hoop-back armchair. Accomplish the gratification of creating an heirloom. 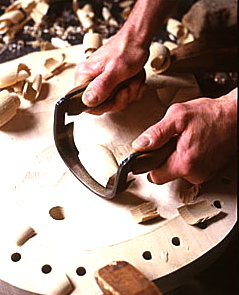 Experience the processes of seat carving, whittling spindles, steam bending, wedging joints, turning, finishing, and the theory of design and durability. We are very pleased to be able to offer this two day “By Hand & Eye Design Workshop” taught by George Walker. Click here to learn more about George. Use this link for the list of tools to bring to class. Experience this rare opportunity to learn my methods for successful steam bending and building bending jigs. Watch the process of sawing logs into boards using a portable sawmill and cut them into bending stock. Participate in the process of steaming the wood, “hands on” bending and hand-riving logs into boards. Learn techniques I’ve perfected over my 41 years of experience. Bring your own piece of furniture for evaluation and guidance in its restoration. In this one day class, you will learn about the history and construction of your piece, and benefit from other students’ examples as well. Experience hands-on instruction using optimum methods in furniture repairs and finishing. Restore your woodworking hand tool, in this great learning experience. Bring a hand tool and learn to clean, sharpen, and use it effectively on your next woodworking project. Don’t have a tool that needs restoration? No problem. There are numerous unique hand tools available in my workshop for learning. All classes offered are perfect for the novice as well as the experienced woodworker and are limited in size to ensure personal one-on-one instruction in an enjoyable environment of camaraderie. Please click here to view and print our Registration Form. Click here for information about nearby accommodations.